The deadline for articles, press releases and sponsored White Papers for the next issue of S&T Journal (e-Digest) No.7, Vol.81, July 2007 is 11 July 2007. You can submit your article or press release online. For more information and instructions of preparation click <here>. 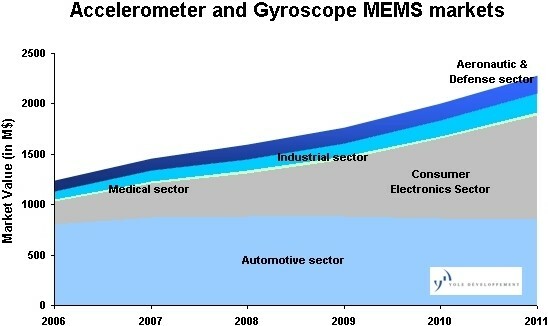 Gyroscopes and accelerometers market has been increased by 55% between 2005 and 2006. In 2006, the market reached 232 MUS$. An average 35% CAGR for 2006-2011 periods is expected. According to an analyst at Yole “the market dynamic mainly comes from accelerometers: about 65% of the total inertial sales by 2011. Consumer applications will progressively take a 40% share of the total inertial MEMS activity by 2011 (including automotive, medical, industrial, aeronautic and defence sectors).” The sales of the major players are rather concentrated on few contracts. For example, the 3 axis accelerometer manufacturers - such as ADI, STM, HKD, Kionix, Hitachi Metal etc - have sales ranging from 6M$ to 40M$ depending on the volumes they have captured (2006 estimations). Electronic Stability Control (ESC) is definitely the most existing application within the automotive area: more than 5 players have competing development programs in addition to the 4 in volume production today (i.e. Systron Donner Automotive, Bosch, SSS and Panasonic). Furthermore different technology choices have been made. While silicon based devices have been told to have strong cost reduction potentials, quartz based devices have very promising performances over large temperature range. The MEMS inertial manufacturing strategies are relatively stable in this area today but it will change. Most of the players have internal fabs today and half few new entrants are using external foundries. Inertial defence companies face the similar manufacturing challenges than the automotive industry. How to remain cost competitive with an internal fab? Invest in the fab to keep the manufacturing internally or transfer production to an appropriate foundry? Yole Developpement will release end of May a specific report analysing the high performance accelerometer and gyroscope market: High performance inertial MEMS market report. The Sensors Web Portal's Media Kit 2007 has been up-dated on June 2007. Now you can advertise your related products, services, job positions offers, exhibitions, conferences, training courses, books, etc. In addition to our ads services customers are able now to read our Sensors Industry News on their mobile phones.